For a very long time, the WWE (World Wrestling Entertainment) had to deal with the death of a handful of wrestlers who were on their active roster. While Owen Hart died in an accident on a pay per view, most of them like Eddie Guerrero and Brian Pillman were dying from heart conditions while in their 30s. Somehow when these wrestlers died, the show did go on. When Owen died while plummeting from the arena ceiling to the ring, the pay per view actually continued. On June 24, 2007, the WWE broadcast a pay per view called Vengeance. Chris Benoit was supposed to wrestle CM Punk for the ECW Championship. He never made the pay per view or the live event the night before because Chris had killed his wife and son. Benoit claimed to some of his co-workers that his son and wife were sick from food poisoning. However, the early morning of the pay per view, Benoit texted to a co-worker that said that the family’s dogs were in the enclosed pool area, and also noted that a garage side door had been left open. Shortly thereafter, Benoit used a weight machine to hang himself. WWE officials learned of the text messages and alerted the Fayette County (Georgia) Police. The police notified WWE around 4:15 p.m., that they had discovered three bodies at the Benoit home and the house was now ruled as a major crime scene. Based on Benoit not appearing on shows that weekend, the excuses about his family, and his cryptic messages, a murder-suicide was a strong possibility. WWE canceled the scheduled three-hour-long live Raw show that night (which, coincidentally, was supposed to be a memorial for the Mr. McMahon character), and replaced the broadcast version with a tribute to his life and career adapted from a DVD that they had released a few years earlier. It wasn’t until after Raw concluded, that the Police saw murder-suicide as a strong possibility. While I might be second-guessing here, the fact is that Benoit’s weird behavior made a murder-suicide as a strong possibility. 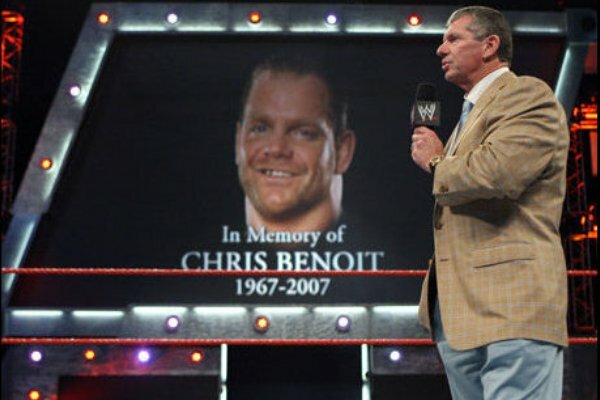 When I saw Raw live that night, I didn’t know about Benoit’s actions that weekend, so I assumed that it might be carbon monoxide poisoning or home invasion, I couldn’t imagine a murder-suicide especially with the WWE honoring them. Like the WWE, I was wrong too. The WWE had egg on their face, so they had to make mention the following night on ECW on SCI-Fi TV by announcing that they knew the details of what Benoit did and would no longer mention him. The WWE scrubbed Benoit from history and only over the past couple of years, has been showing his matches again.